nanjIyar and periyavAchchAn piLLai highlight that along with subrahmaNya who is the chief of the army of the dhEvas, all the dhEvas who are given the position to manage the activities of the material universes (by bhagavAn) have arrived with their wives, vehicles, servants, etc., to worship emperumAn and have their desires fulfilled. thoNdaradippodi AzhwAr requests emperumAn to wake up and give them his merciful vision. arangaththammA – Oh my lord/master lying down in srIrangam! The 12 Adhithyas arrived in their best and big chariots. The 11 rudhras who are the controllers of the material world and the materialistic people have arrived. The six headed subrahmaNya have arrived with his most suitable peacock vehicle. The 49 maruthas and the 8 vasus have arrived to the front pushing each other. Oh our lord/master who is lying down in srIragangam! please wake up now to bless us. Staying close in a huge crowd, the dhEvas, along with their chariots and the horses are engaged in great singing and dancing. Groups of dhEvas along with subrahmaNya in a huge crowd arrived at the front of the temple which resembles a huge mountain, seeking the divine vision of you. Oh my lord/master lying down in srIrangam! (Thus,) you kindly wake up and give your blessings. AzhwAr requests that as both prayOjanAntharaparars (ones seeking materialistic benefits) such as dhEvas and ananya prayOjanars (ones seeking emperumAn‘s kainkaryam only – like AzhwAr himself) have arrived, periya perumAL should wake up and give them a merciful glance and bless them all. For 11 rudhras being said as “iRaiyavar” (controller), a pramANam from yajur samhithA 6.2.8 is highlighted. Here rudhran himself prays to dhEvas “sObravIth varam vruNA ahamEva | pasunAmadhipathirasANIthi thasmAth rudhra: pasunAmadhipathi: ||” – I pray unto all of you dhEvas that I should be the leader of these samsAris who are like pasu (cow/cattle/animal). That is why they are said as iRaiyavar by AzhwAr here – since they control the material world and the materialistic people. 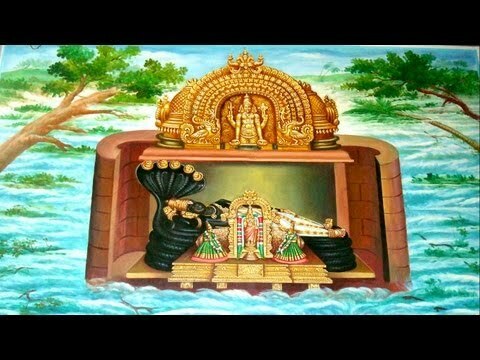 For INdiya veLLam (flood), it is explained that there are many many dhEvas, etc., who have arrived to worship periya perumAL in srIrangam. For kumara dhaNdam – 2 interpretations are given. First, kumaran means subrahmaNyan and dhaNdam means stem/stick (in this context, something thick and well maintained). This means that the servants/soldiers are explained as a stick that is held tightly together (dhEvas standing so close to each other due to the huge crowd). dhEvas look like very young adults (only 16 year old) and have that ever-lasting youthfulness. dhaNdam means collection. So “kumara dhaNdam” means a huge crowd of dhEvas. dhaNdam also can indicate the collection of weapons they hold. This entry was posted in mudhalAyiram, thiruppaLLiyezhuchchi and tagged thiruppalliyezhuchi thondaradippodi alwar on January 3, 2015 by Sarathy Thothathri.